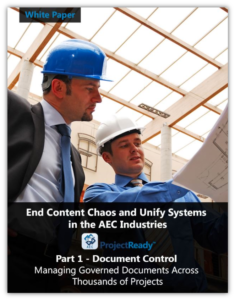 The Architecture, Engineering and Construction Industry’s expansive projects produce massive amounts of documents and data that, gone unmanaged, can result in wasted time, legal issues and ultimately affect the bottom line. Fortunately, with implementing a robust and easy to use document control program those problems can be solved. Copyright @ 2018 ProjectReady all right reserved.